Saturday was the 48th World Wide Sketchcrawl. Luckily Susan remembered or I would have missed it. I usually get an email about it but it one must not have been sent out. 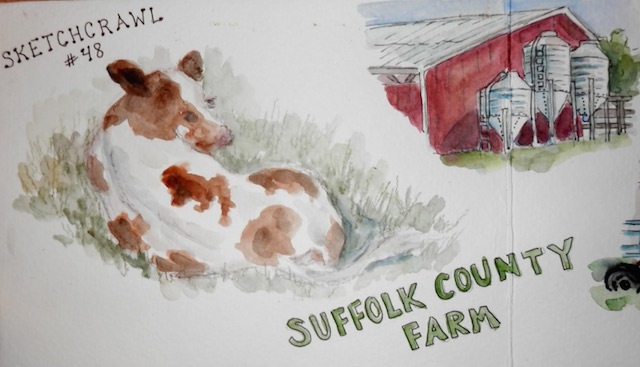 Susan and I decided to sketch locally and went to the Suffolk County Farm in Yaphank. 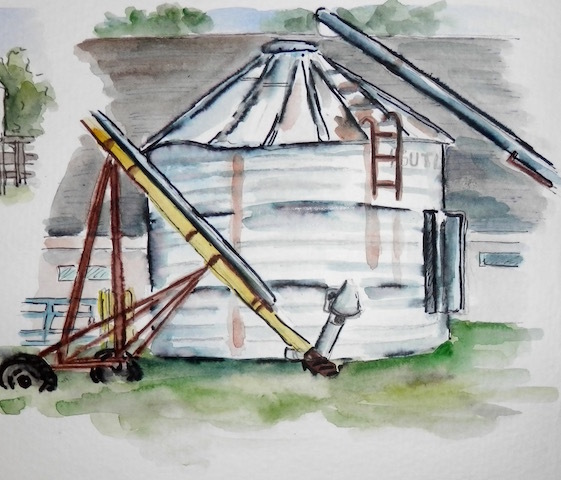 There are lots of barns, silos, and some animals. It was warm and luckily there are trees around for shade. Our sketching started around 9 and ended about 1. We found a corral that had two calves. They were cute but not too cooperative. Both spent most of the time sitting down, not showing their faces. The red barn with the silos is where they sometimes feed the cows if they aren't in the pasture grazing. 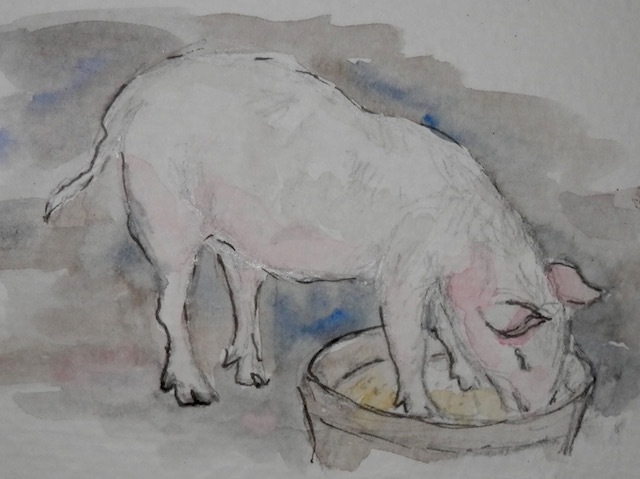 I like sketching them there because they are usually eating from the trough where they stay put and are close. This is on of the larger silos. The door was open. I should have peeked inside to see what was in there. There was a kid's birthday party going on. These two little girls liked petting the horse who much preferred keeping his head down and grazing. 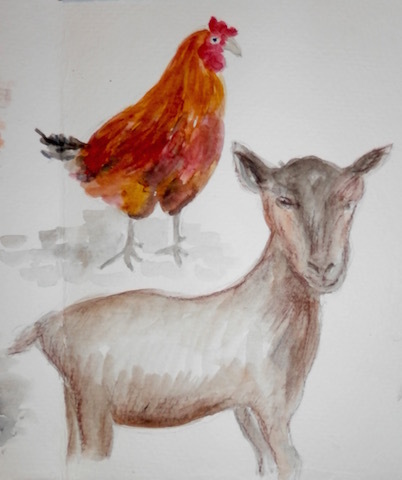 and a rooster and a goat. 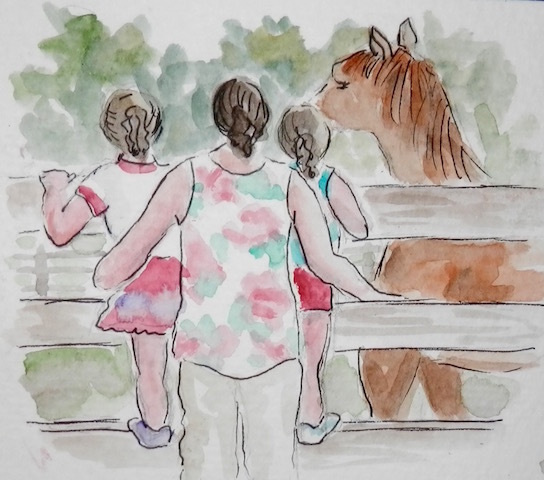 After sketching at the farm, Susan and I headed over to Bellport for the opening of the Paper Cup Gallery where a few LI urban sketchers have work on display. Check out the post below...Susan did an entry about that.